Hey Dearies! So, the Facebook poll winner for this week was the Autumn Pumpkin! So, that is what we will be talking about today! These are so cute to have as your table center or a cute gift for the kids! The pattern is completely free and a big shout out to the creator for sharing this! The pattern is using Red Heart Yarn and they are using the colors Flame and Cafe. Of course, you can use whatever color you would prefer. This will be used to stuff the pumpkin. *Note* At the end of each round, slip stitch at the top of the 1st stitch at the beginning of the round. Round 1: Make 9 half double crochets in the loop created and chain 1. Round 2: Make 2 half double crochets in half double crochet. Chain 1. Round 3: For 9 times, make 2 half double crochets in the first stitch. Then half double crochet into the next stitch. Chain 1. Round 4: Make 2 half double crochet. For 8 times, make 2 half double crochets in the next stitch and 2 half double crochet in the following stitches. Chain 1. Round 5: For 9 times, 2 half double crochet in the first stitch and 3 half double crochets in the following stitches. Chain 1. Round 6: Make 2 double crochets. For 8 times, make 2 half double crochet in the first stitch and 4 half double crochets in the following chains. Make 2 half double crochets in the next stitch. Another 2 half double crochet. Chain 1. Round 7: For 9 times, make 2 half double crochets in the first stitch and 5 half double crochets in the following stitches. Chain 1. Round 8: For 9 times, make 2 half double crochets in the first stitch and 6 half double crochet in the following stitches. Chain 1. Round 9-28: Half double crochet in each st around. Chain 1. Round 29: For 9 times, make 2 half double crochets and then 6 half double crochets for the following stitches. Chain 1. Round 30: For 9 times, make 2 half double crochets and then 5 half double crochets for the following stitches. Chain 1. Round 31: For 9 times, make 2 half double crochets and then 4 half double crochets for the following stitches. Chain 1. Round 32: For 9 times, make 2 half double crochets and then 3 half double crochets for the following stitches. Chain 1. Round 33: For 9 times, make 2 half double crochets and then 2 half double crochets for the following stitches. Chain 1. Round 34: For 9 times, make 2 half double crochets and then half double crochets for the following stitches. Chain 1. Cut the yarn, leaving about 48″ strand. Making the pumpkin stem: Using the color for the pumpkin stem, pick up chain 2 anywhere along the last row of the pumpkin. *Note* At the end of each round, slip stitch at the top of the 2nd stitch at the beginning of the round. Round 1: Make 2 double crochets 2 together, 9 times. Chain 2. Round 2: Double crochet in the back of each double crochet stem from the previous round. Chain 2. Round 3-7: Repeat round 2, 5 times. Yarn off. Vertical Ridge Edging: Now, I’m not a pro at this, so it is a learning progress for me, as it might be for you, for this part, I’m and going to advice you to look at the pattern, by clicking the link above. This is the part were you make the pumpkin look like a pumpkin. I wish I could explain it in my words, but the pattern does a better job then I do and I don’t want to copy and paste it onto this blog. Hey Dearies! So, I just wanted to let you know that I did not do a live for this project on my Facebook page, so I am just going to give you guys the pattern, but of course, broken down to a easier way. Because this pattern is by Red Heart, they suggest to use Red Heart Brand, which I did in the white and for the eyes, black. You will need this for making the eyes. You don’t need this, but it is very helpful when it comes to counting rows. It makes it easier to not get lost in the pattern. Let’s Begin! Let’s start by making a slip knot on our hook and chaining 2. Row 1: Single crochet into the 2nd chain from the hook. Turn your work. Row 2: Chain 1. Make 2 single crochets into the next stitch. Turn your work. Row 3: Chain 1. Single crochet in the first stitch. Then make 2 single crochets in the next stitch. Turn your work. Row 4: Chain 1. Make 2 single crochets in the first stitch. Single crochet in each of the last 2 stitches. Turn your work. Row 5: Chain 1. Single crochet in each of the first 3 stitches. Make 2 single crochets in the last stitch. Turn your work. Row 6: Chain 1. Make 2 single crochets in the first stitch. Single crochet in each of the last 4 stitches. Turn your work. Row 7-9: Chain 1. Single crochet in each stitch across. Turn your work. Row 10: Chain 1. Single crochet 2 together (sc2tog) over the first 2 stitches. Single crochet in each of the next 2 stitches. Single crochet 2 together (sc2tog) over the next 2 stitches. Turn your work. Row 11: Chain 1. Single crochet in each stitch across. Chain 10. Turn your work. Row 12: Double crochet in the 4th chain from the hook. Double crochet in the next 2 chains. Half double crochet in the next 3 stitches. Single crochet in the last chain. Single crochet in the next 4 stitches. Chain 10. Turn your work. Row 13: Double crochet in the 4th chain from the hook. Double crochet in each of the next 2 chains. Half double crochet in each of the next 3 chains. Single crochet in the last chain. Single crochet in the next 7 stitches. Half double crochet in the next stitch. Double crochet in the next stitch. Double crochet 2 together (dc2tog) over the next 2 stitches. Turn your work, leaving turning chain unworked. Row 14: Chain 1. Single crochet 2 together (sc2tog) over the first 2 stitches. Single crochet in each of the next 11 stitches. Half double crochet in the next stitch. Double crochet in the next stitch. Double crochet 2 together (dc2tog) over the next 2 stitches. Turn your work, leaving turning chain unworked. Row 15: Chain 1. Single crochet together (sc2tog) over the first 2 stitches. Single crochet in each of the next 11 stitches. Single crochet 2 together (sc2tog) over the last 2 stitches. Turn your work. Row 16: Chain 1. Single crochet 2 together (sc2tog) over the first 2 stitches. Single crochet in each of the next 9 stitches. Single crochet 2 together (sc2tog) over the last 2 stitches. Turn your work. Row 17-25: Chain 1. Single crochet in each stitch across. Turn your work. Row 26: Chain 1. Single crochet 2 together (sc2tog) over the first 2 stitches. Single crochet in each stitch across. Turn your work. Row 27: Chain 1. Single crochet in each of the next 8 stitches. Single crochet 2 together (sc2tog) over the last 2 stitches. Turn your work. Row 28: Chain 1. Single crochet 2 together (sc2tog) over the first 2 stitches. Single crochet in each of the next 6 stitches. make 2 single crochets in the last stitch. Turn your work. Row 29: Chain 1. Make 2 single crochets in the first stitch. Single crochet in each of the next 6 stitches. Single crochet 2 together (sc2tog) over the last 2 stitches. Row 30: Chain 1. Single crochet 2 together (sc2tog). 1 Single crochet in the next 6 stitches. Make 2 single crochets in the last stitch. Turn your work. Row 31: Chain 1. Make 2 single crochets in the first stitch. Single crochet in each of the next 4 stitches. [Single crochet 2 together (sc2tog) over the next 2 stitches] twice. Do not fasten off yet! 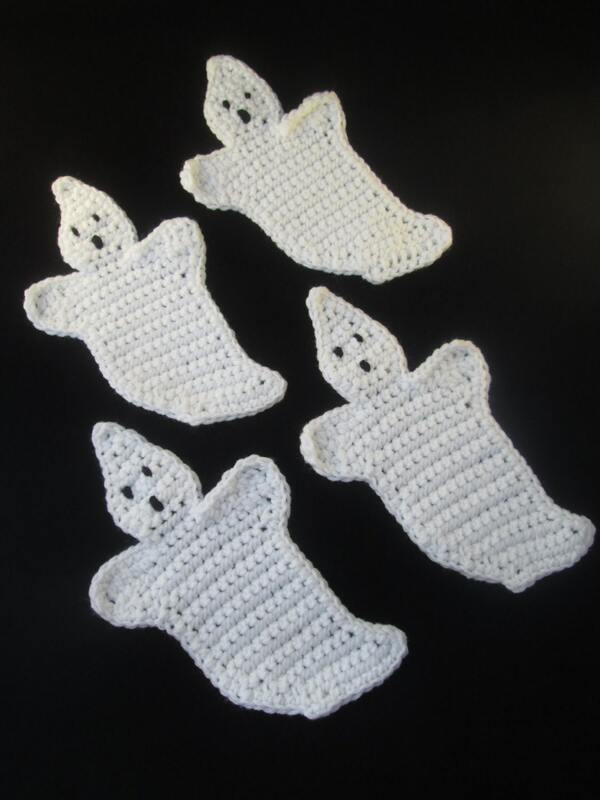 Edging: Chain 1 and single crochet all around the ghost. Work 3 single crochet in the same stitch for the very top of the ghost and the bottom points. Once you reach to where you started, fasten off. *Note: You can stick with the plain white, for the edging, or do a different color, such as black or orange. For this pattern, they used just white. Making the eyes and mouth: With a yarn needle, and the black yarn or the color of your choice. For the eyes, embroider 2 French knots (If you don’t know how to do them, the video that shows you how to make these will show you how to make the French knots.) For the mouth, embroider satin stitches over 2 rows for an oval-shaped mouth. Normally, I go live with the pattern the same day I post them, but because I do not want to behind on the many patterns and projects I have in mind, I won’t be doing one. If you are interested in voting on a project or pattern or want to know when I go live with the projects, just check out my Facebook Page.